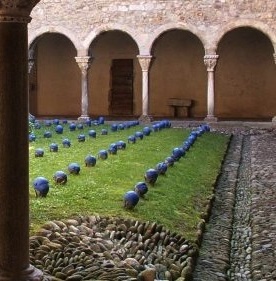 One of the best-known celebrations of music in the region is the Festival de Comminges (July and August) which has acquired international recognition thanks to the magical settings in which the concerts are held; the magnificent Cathedral of Saint-Bertrand de Comminges, the Basilica of Saint-Just de Valcabrere, the collegiate church of Saint-Gaudens and the Roman church of Martres-Tolosane. Then there is the quality of the orchestras and choirs which take part, the diversity of the programmes and the fact that every year, the festival commissions new works from great composers. 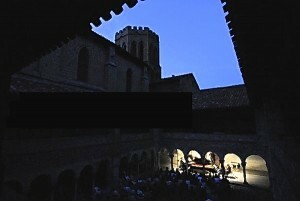 The Saint Lizier Festival (July and August) is the oldest classical music festival in the Midi-Pyrenees region held in the prestigious setting of the Saint Lizier cathedral in one of the ‘plus belles villages de France’. Each year well-known composers and musicians perform a wide repertoire of classical pieces to appreciative audiences of all ages. Jazz Sur Son 31 offers music and concerts for jazz lovers throughout the year in various locations around Toulouse. The concerts combine international stars, local artists and young, emerging talents. This is a programme of great diversity open to everyone. Chaud Les Musiques – the ‘Toulouse in Summer’ Festival (July and August) aims to showcase the wealth of culture and creativity for which Toulouse is well known. The festival is made up of twenty concerts that take place in emblematic venues all over the pink city. This eclectic festival combines all types of music; jazz, classical, flamenco and traditional for all tastes performed both by well-known talents and by the artists of tomorrow. Festival Rite, in Saint Girons is a festival held over one week, celebrating the music and dance traditions and different cultures from around the world. Held in the springtime, over 250 artists; musicians, dancers and singers from eight countries, put on a week of shows, concerts and demonstrations in and around Saint Girons. 31 Notes d’été is a diverse and eclectic festival held all over the Haute Garonne region during the summer months. There are over 31 free concerts and shows in 31 communes of the department covering all types of music from classical to Latin-American, jazz to traditional and open to everyone. Les Explorateurs du Temps is a popular and unique open air show that takes place in the lovely, historic town of Foix in August. It is a great family show illuminating particularly turbulent periods of history. With more than 200 actors, acrobats and dancers along with extraordinary special effects, giant images projected on to the Foix castle, fireworks and spectacular scenery on a stage 50 metres long, this is a great – and educational – night out. Local Fetes: Even the smallest village (and many a hamlet) hold their annual village fête which will usually last a whole weekend and include live music, dancing and often a boules completion, all regularly punctuated with a variety of delicious repas – big three or four course meals served at long trestle tables featuring a wide range of local specialities. At these fêtes all generations are represented and happy to eat, dance and sing together into the early hours. On the 21st June the annual Fête de la Musique is held all over France and this tradition is celebrated with gusto in the region. 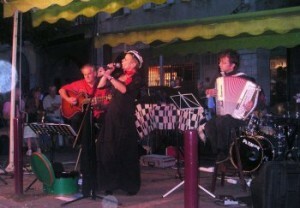 The Saint Girons music festival is particularly worth a visit, with a great atmosphere, free concerts all over the town, all ages performing dance and music in the streets along with a variety of bands strutting their stuff on the terraces of the cafés and restaurants. Autrefois Couserans is a festival of local rural traditions which takes place over the last weekend in July, culminating in the famous Sunday parade with everyone dressed in colourful, traditional costumes, folk dancing, ancient tractors, farm machinery and animals herded through the streets in a great display of organised chaos. 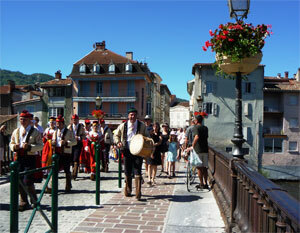 There is also a big street market, lots of demonstrations of traditional arts and crafts and plenty of local character. The Flower Festival in Luchon dates back to 1888 and consists of thirty or more floats decorated with natural flowers parading through the streets of the town. The stunning floral compositions are cultivated during the year by volunteers to be at their very best for this week in August. Transhumance en Couserans is the name given to the herding of farm animals up to higher pastures in the early summer, usually the end of May or beginning of June. A long tradition firmly anchored in the Pyrenean landscapes, the transhumance has become a great pastoral festival. More than 10,000 sheep, a thousand cows and hundreds of horses are moved up through the nine valleys of the Couserans to dozens of summer pastures in the mountains where the animals will spend the summer in total liberty. It is possible to join them on parts of their journey through the valleys or watch the spectacle of them being driven through the towns and villages, stopping everything in their tracks. Tracé a main levee in the Couserans valleys of the Ariege is an art exhibition that takes place all over the region during certain weekends of the year. Numerous artists from painters to sculptors to poets and muralists open the doors of their studios and homes to the public free of charge. Martres-Tolosane has been renowned for its earthenware for over three centuries and it is still a way of life for the town, as well as a living art. Nine master potters are active in the town and each autumn, the ‘Salon des Arts’ fair attracts pottery designers from all over France, Holland, Algeria and Spain to show off the different techniques of ceramics, porcelain, stoneware and enamels. Wishing you all a very happy summer.